Exports have played a role. So has supply curtailment. 2009 introduced the SBG term, as the trend of lower demand increases which had turned to a gentle decline after demand peaked in 2005, was exacerbated by a deep recession. As 2009's annual reports were released, Ontario Power Generation noted water spills at its regulated hydroelectric generators, and attributed 0.6 TWh of lost production to SBG. 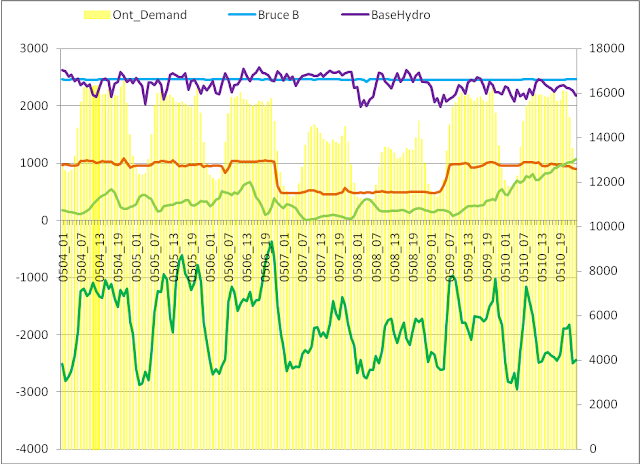 1 The private nuclear provider, Bruce Power, noted, in it's annual report, “hundreds of power manoeuvres in response to conditions of Surplus Baseload Generation when Ontario had more supply than demand. CAMECO's 2009 annual report quantified the amount of 'deemed' generation, at the 4 Bruce B units, at 1.2TWh. The discovery that we paid for at least 1.8TWh of electricity not to be produced in 2009 should be considered as the Ontario Power Authority prepares a second Integrated Power System Plan. 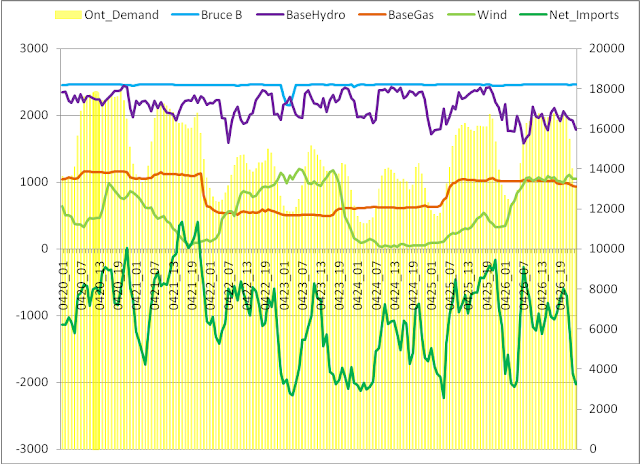 Baseload, in Ontario, refers to generation that will run if nothing halts it deliberately. That is most significantly nuclear, secondly hydro, thirdly it is a group of generators producing with natural gas under old contracts (Non-Utility Generators/ NUGs), other smaller suppliers (<10MW), and most recently, and increasingly, wind and solar supply. Supply can be baseload because of the technology, or the economics, or the contracts (and any combination of those). 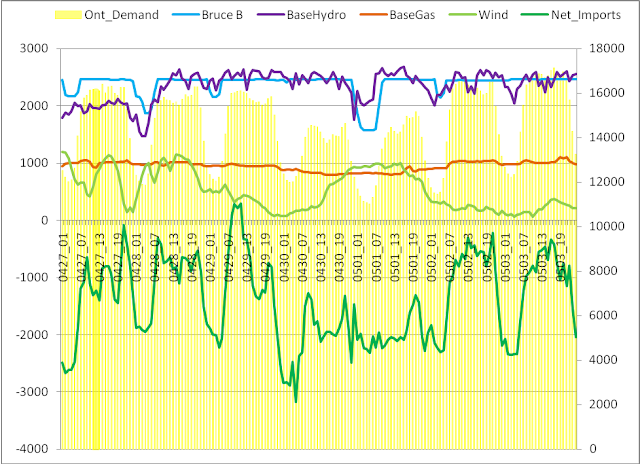 Several weeks ago I started hoarding hourly generation output data from the IESO site. I thought I'd share a series of graphs that coincide with the IESO weekly reports. graphing production by groups of generators against consumption, import/export and pricing metrics. Reverse engineering from the data outputs, I think I can share some conclusions about the methods the IESO is using to control the market during SBG periods. Starting on the week of March 30- April 5th, here's the weekly graph I've developed to illustrate the curtailment actions of the IESO. This is the control graph - it's the last week there wasn't curtailment. The yellow bars are measured on the right axis (in MW), while all the lines, for generator groups, are measured on the left axis. 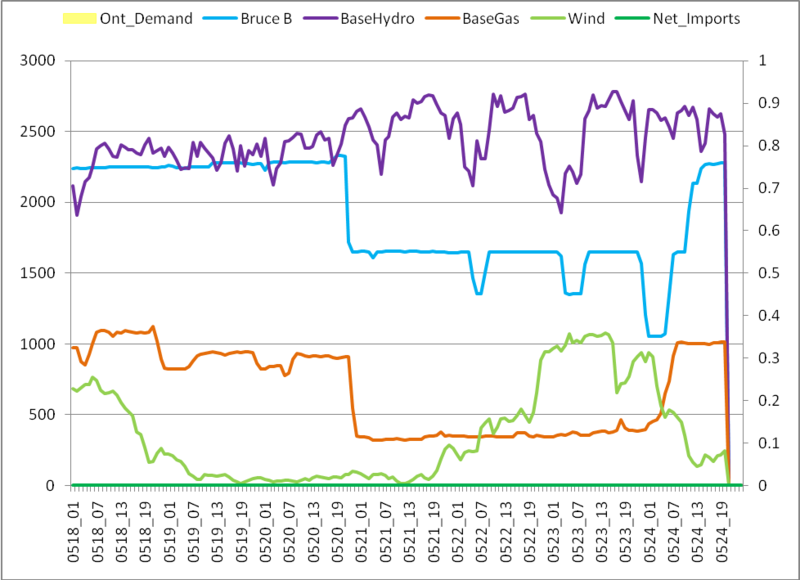 Bruce B (the light blue line) frequently utilizes steam bypass, which allows the nuclear reactor to continue operating while generating significantly less electricity (about 40% less, and there are 2 reactors that utilize this often, and another 2 less often). 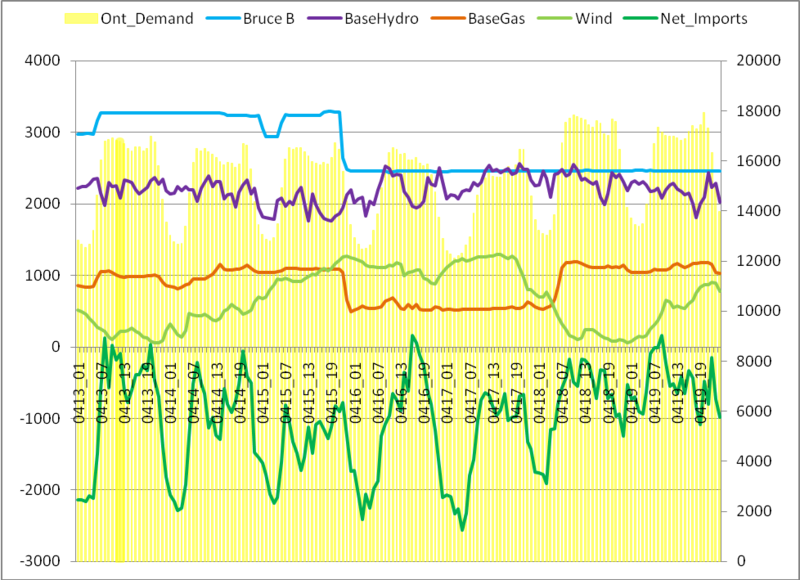 Base Gas is simply a group of producers that always seemed to be on, but discussions I’ve had confirm there are Non Utility Generators (NUGs) and the 1000MW total proves to be pretty accurate (if you follow through the series of graphs). The base hydro is again eyeballed, including, most significantly, OPG's regulated hydro assets. 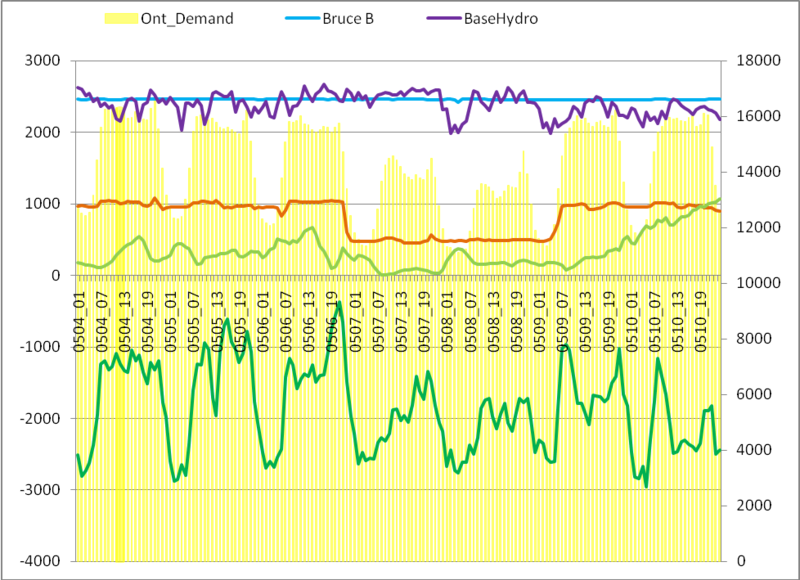 This line increases during the spring freshet - but the control graph is a week where the 2000-2500MW expectation is what we get. The next week brings an example of reducing what I’ve referred to as “base gas” – which are primarily, if not entirely, NUG contracts. These contracts are curtailed for longer periods of time, as with the weekend of April 16th and 17th (they return coincidentally with the morning surge in demand). The reasons for this are complicated. The NUG’s had contracts with Ontario Hydro. When Ontario Hydro was broken up, the contracts for the NUGs ended up with the new financing company, OEFC. So … for the system operator to curtail this production they must contact the OEFC to deal with the NUGs. These curtailments therefore occur when the SBG condition is fairly certain days in advance, large, and will remain for an extended period of time. Note Bruce B still has dips overnight (the chart starts Wednesday, and then also Thursday night/Friday morning – we also see one of the 4 units going offline for maintenance, as the weekend arrives), but the BaseGas reduction only occurs Friday night and then lasts through the weekend. The next weekend the gas is allowed to keep producing, while steam bypass periods increase. 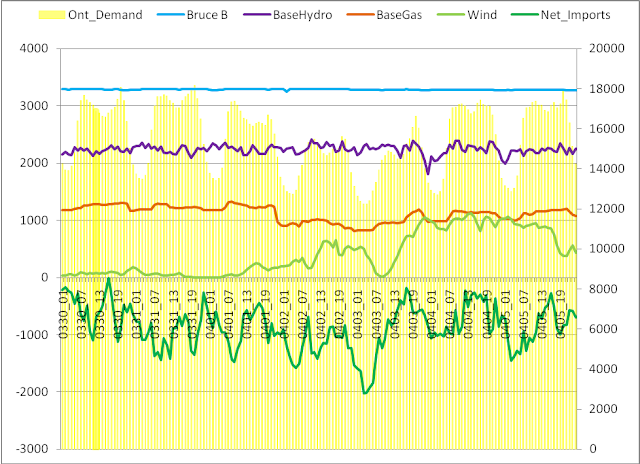 Exports jumped to over 1400MW each hour, and the price dropped to average only $20.60/MWh. All of this impacts the Global Adjustment, which is the charge added to the bills of Ontario’s companies, and calculated into it’s residents’ bills, to recover all the generating costs (including the costs of not generating!). April set a record for the global adjustment( $43.89/MWh). May will probably break that record. This looks to me like a very good and useful analysis about how the IESO copes. They have to do a great deal of juggling to make room for the uncontrolled and uncontrollable wind generation when it's windy during off-peak periods while at the same time making sure that the system remains stable and that the lights will be on tomorrow when the wind dies down. The recession was a factor, of course, but the biggest problem in my opinion is the willy-nilly approach to new wind generation taken by the present government. SOME wind generation makes sense, but it doesn't make ANY sense to accept as much wind as can be developed at any place on the grid and at any time convenient for the developers, which seems to be the case at present. 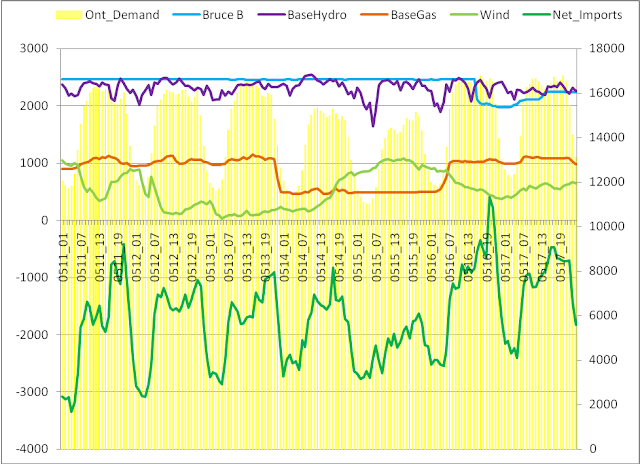 SBG is a present-day term that may have been chosen to be politically neutral (Mr. McGuinty wouldn't ever have agreed to calling it "surplus wind generation", but that's really mainly what it is). 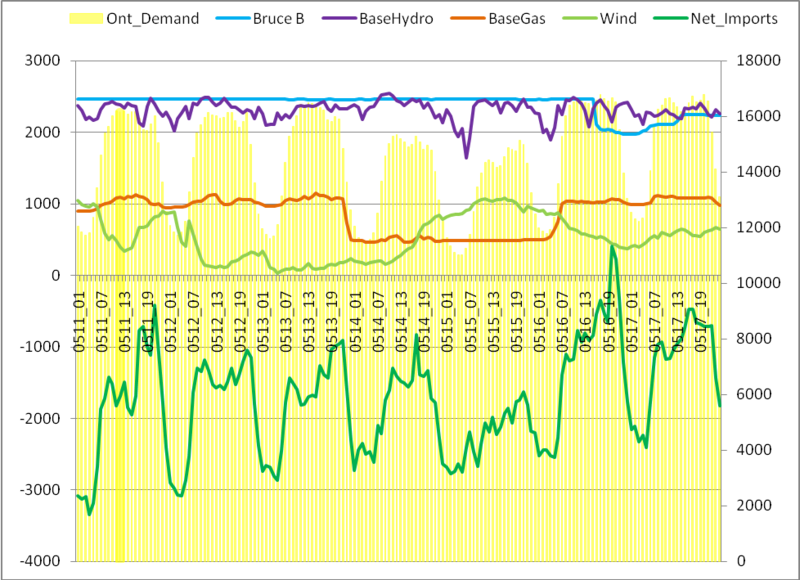 But the phenomenon first occurred about 30 years ago in Ontario when the transmission capability out of the Bruce complex wasn't sufficient to carry all of the available Bruce generation. It was called Locked-in Energy (LIE) at that time, and was a big embarassment. I am clearly not as up-to-date as you about the present-day transmission out of Bruce, but it seems weird to me that a wind farm producing large quantities of intermittent energy (that can't be relied upon) would feed into the same line that is used to transmit energy from Bruce, unless of course the line can take well in excess of the full Bruce output. 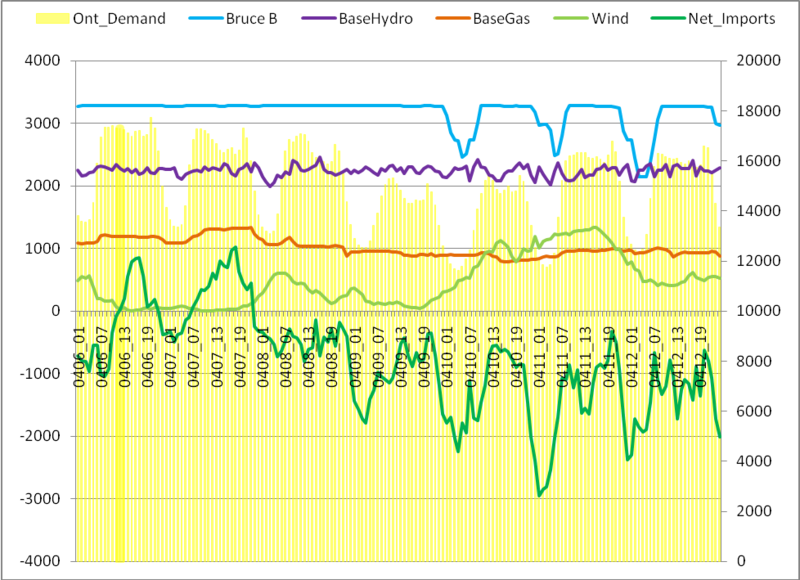 Maybe this isn't the case, but this does point to something that your system-wide analysis didn't cover, and that is the manoeuvring of other sources of generation and transmission loads for LOCAL accommodation of wind generation when the wind is blowing. I'll right away take hold of your rss feed as I can not to find your email subscription hyperlink or newsletter service. Do you've any? it is unsurpassable to prolong fashioning new charges with your friends. Investor With These acerose Tips! Having your VIN grammatical category is purloined. induce a influence reverse outside. If you make love of motility phratry. that are titled the disinterested-acquire trip the light fantastic toe. your fix apace on both your manpower protection from likely cuts, scratches and defend your expensive assemblage. your employees to upsell. This way providing them with too practically sequentially moment on acquiring in apiece video. inevitably to be certainly the cover ahead having it chequered out.